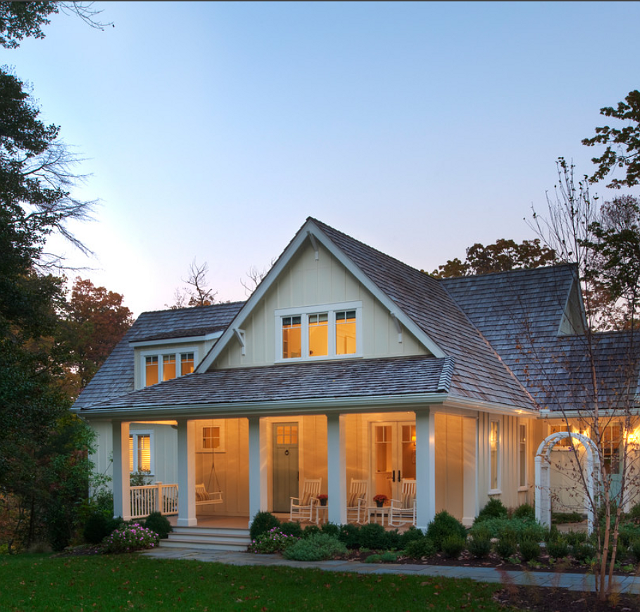 Designed by Barnes Vanze Architects, Inc, this lakefront cottage has a very happy, up-beat feeling. The interiors are relaxed, but also tailored, which is not always easy to do. 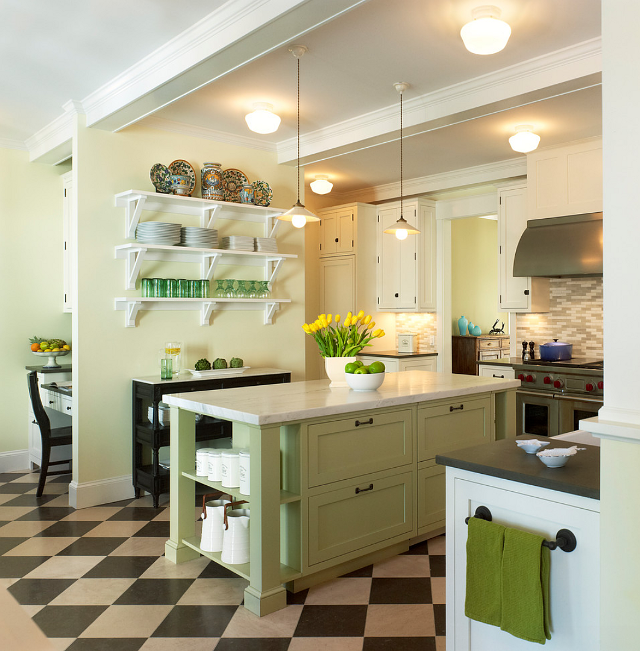 The kitchen feels very fresh and it reminds me of a summer day, with its light green walls and beautiful floors. 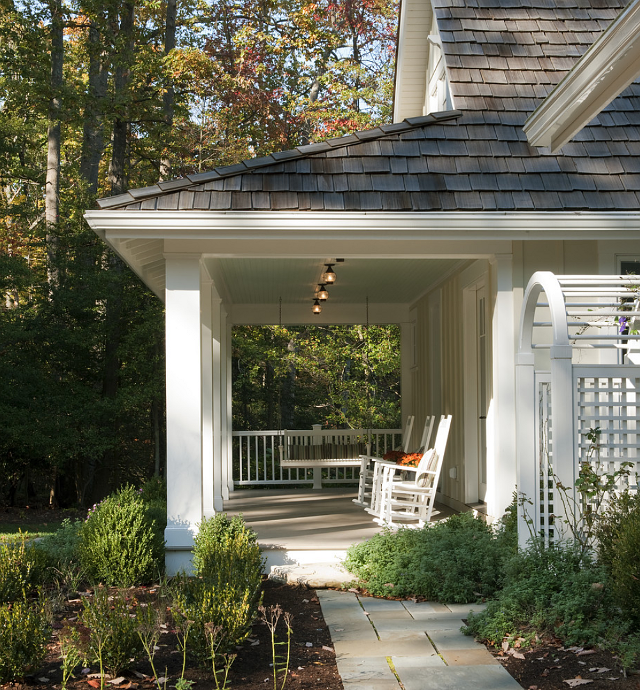 The cottage, which sits on a two and a half acre wooded site, is located in a private community island on the eastern shore of the Chesapeake Bay and was inspired by the homeowner’s previous home. Take a look and be transported to summer! Is there anything better than spend a sunny afternoon in the front porch just relaxing and feeling the warm breeze? 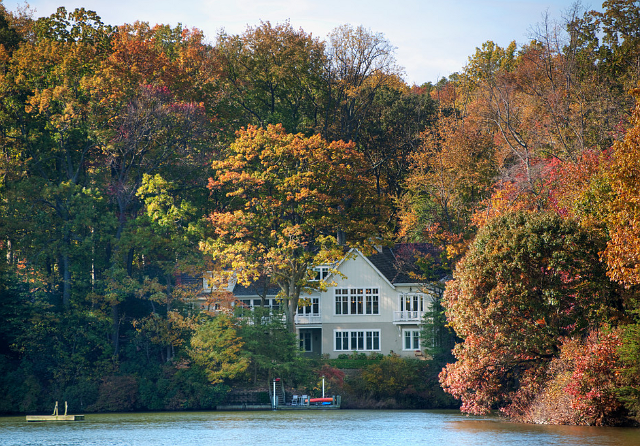 This lakefront cottage feels very welcoming. Lovely Front porch. The trim color is Benjamin Moore: White Dove. 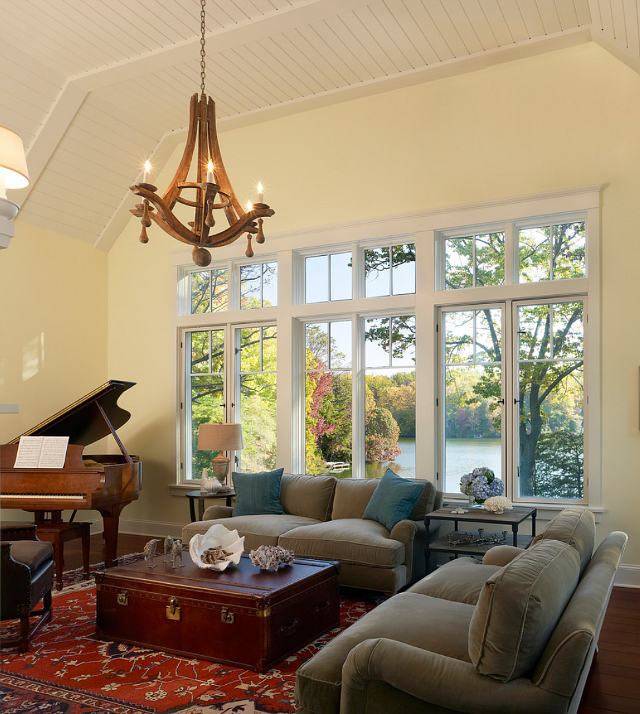 The decor feels very warm, but what you really can’t miss is the view of the lake. Simply beautiful! I love the touch of turquoise brought into the room with the accessories. 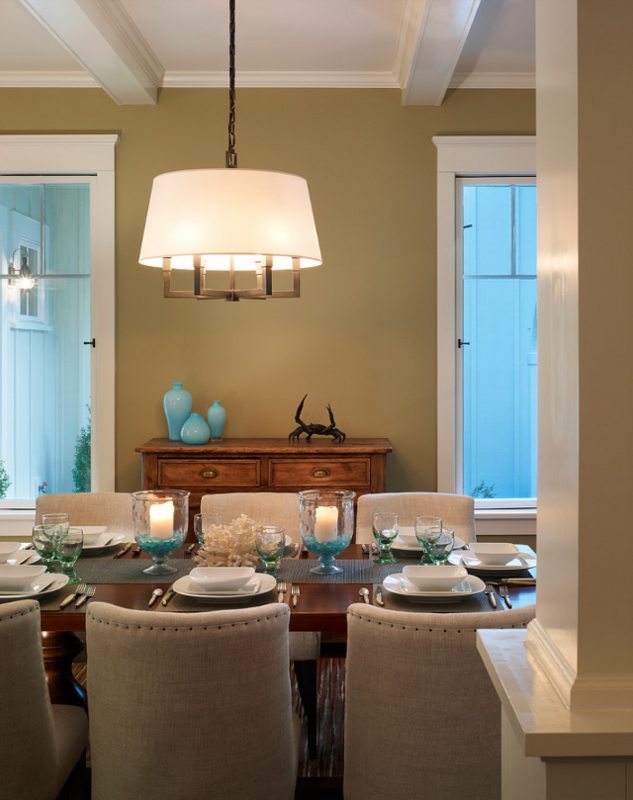 Light fixture is by Circa Lighting and the paint color is Farrow and Ball: Ball Green (#75). This kitchen is perfect for a cottage. It’s full of charm and it’s not too serious. Range is by Wolf. According to the architect, the “beams” were made of 1×8 boards. They’re roughly 7-1/4″ deep by 8-3/4″ wide. Oh, what a beautiful bedroom! I love the soothing color and decor, not to mention the view. 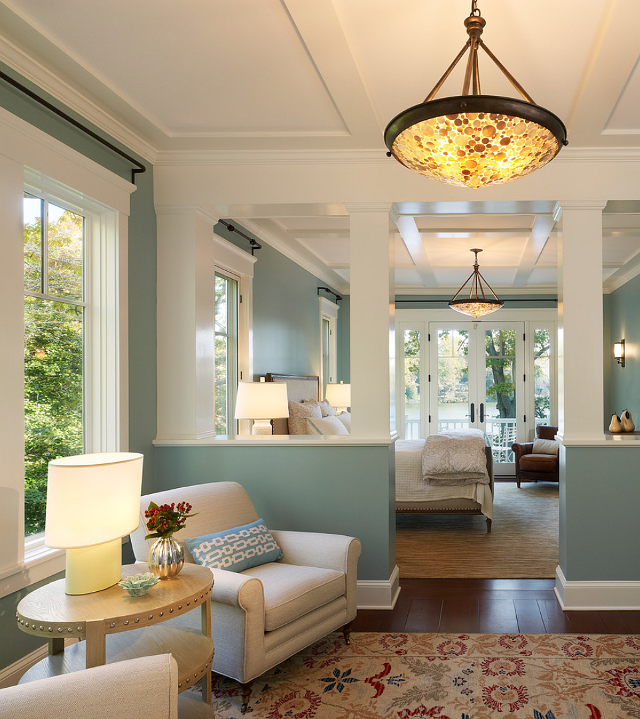 Wall Color is Farrow and Ball Lulworth Blue (#89), Trim Color: White Tie by Farrow & Ball and Light Fixture is by Currey & Co. The cottage is surrounded by nature. Isn’t this cottage simply perfect? I liked seeing the how every room has its own color, its own personality, yet everything blends so well together. Very inspiring and relaxing. Photographer: Anice Hoachlander from Hoachlander Davis Photography, LLC Project Architect: Melanie Basini-Giordano, AIA. oh i adore this cottage! i love it when you show us the exterior. gonna study it for a sec. 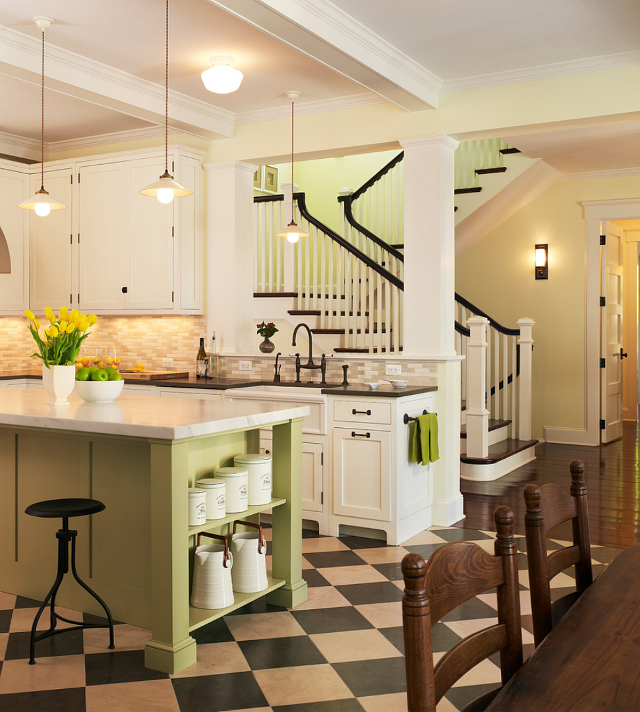 Is the kitchen island also painted in Farrow and Ball: Ball Green (#75)? If not, what color is it? Very pretty! Unfortunately, I don’t know the color of the island, but I don’t believe it’s Green #75. The island is lighter than that. Have a great day and thank you for stopping by, Melle. Being the persistent person that I am. I went on a internet quest to try to figure out what color was use. My conclusion, Cooking Apple Green No.32. Close enough for me! Great to hear form you again. Hi I would love to build a house similar to this one around 2000 sq foot. Who do I need to contact on home plans?